Finkelstein, Maxwell W.. "Terra Nova National Park". The Canadian Encyclopedia, 25 January 2018, Historica Canada. 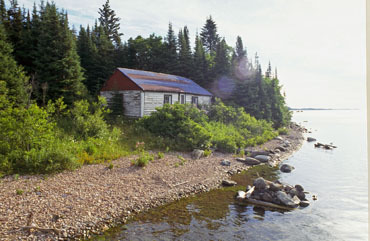 https://www.thecanadianencyclopedia.ca/en/article/terra-nova-national-park. Accessed 18 April 2019. 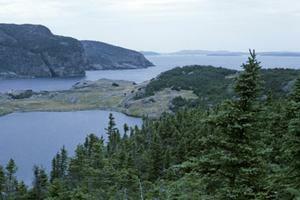 Terra Nova National Park (est 1957, 399.9 km2), Canada's most easterly national park, is located on Bonavista Bay, Nfld. Terra Nova is the Latin form of the name of the island, Newfoundland. Salvage Harbour and Bonavista Bay, part of the coast of Terra Nova National Park (courtesy Parks Canada). 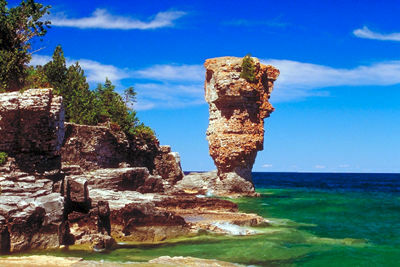 The park's rocky headlands, drumlins, till deposits and numerous ponds show the influence of glacial activity on the landscape. Island-sprinkled bays and deep fjords indent the coastline. Icebergs and whales can often be seen from shore vantage points. The rocky shoreline and teeming waters support colonies of common tern, herring gulls and crevice-nesting black guillemots. Bald eagles frequent the area and nest here. Inland, the boreal forest, composed mainly of black spruce and balsam fir, is home for native species, including beaver, meadow vole, black bear, otter and lynx, and introduced species such as common shrew, snowshoe hare, mink and moose. Caribou, once common in this part of Newfoundland, are still occasionally spotted. Introduced in 1878 and 1904, moose now thrive, and are often seen grazing along the Trans-Canada Highway. Numerous peat bogs provide an ideal environment for orchids and pitcher plants, sprouting from a mat of sphagnum moss. The park shows evidence of Paleo-Eskimo, Dorset, Maritime Archaic and Beothuk cultures; all are now extinct. The teeming waters of Bonavista Bay and Newman Sound have also attracted fishermen for hundreds of years, and some of Newfoundland's oldest settlements were located in what is now the park. Lumbering and fishing began in the park area in the late 1700s, after colonization, and evidence of these activities can still be found. Vehicle-accessible campgrounds are located along the Trans-Canada Highway. 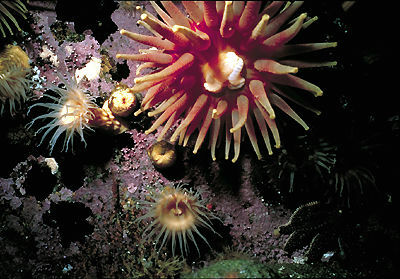 The Marine Interpretation Centre and wharf are located at Saltons.